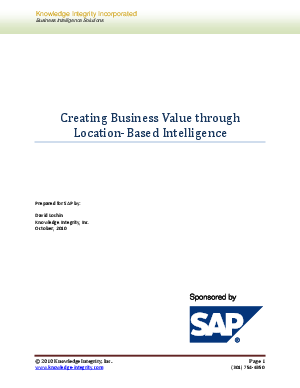 This paper explores the value of location within both operational and analytical applications. The objective of this paper is to provide an introduction to "location-based intelligence" as it relates to the common view of an "address," as well as provide an overview of geocoding and geographic data services. The paper will then examine various ways that geocoding is used within business applications. We'll consider analytical techniques that can be applied across many types of industries and organizations, as well as examine a number of specific usage scenarios for selected vertical industries. The paper then provides an overview of the types of geographic data services, and how those services satisfy the needs of those business applications, without the need of an actual "map." The paper essentially concludes with a description of the types of functionality that one should look for when considering vendors.